This post was created in partnership with Edo Japan. But as always, the thoughts, advice and adventure experiences are truthfully my own. It’s pretty obvious I’m a lover of wintertime here in Canada. 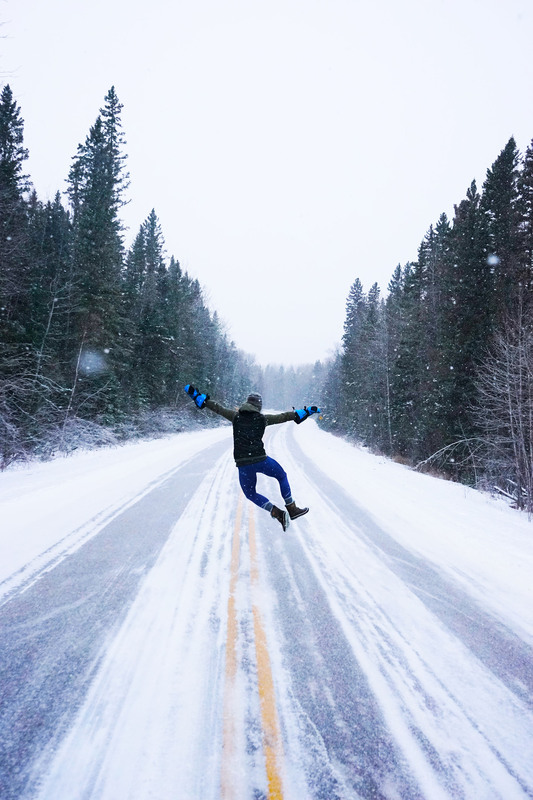 The only change I make from my summer adventures is adding a few more layers of clothing. I find the extra effort to get outside is so worth it as it makes for some unforgettable moments. Unfortunately, there are less than 7 hours of daylight to adventure here in Saskatchewan in December. So I have to make a point to use my time wisely. I will also be the first to admit that I hate cooking. I especially dislike when cooking in the snow on a camp stove takes extra time when I would rather be on the trails skiing and exploring. 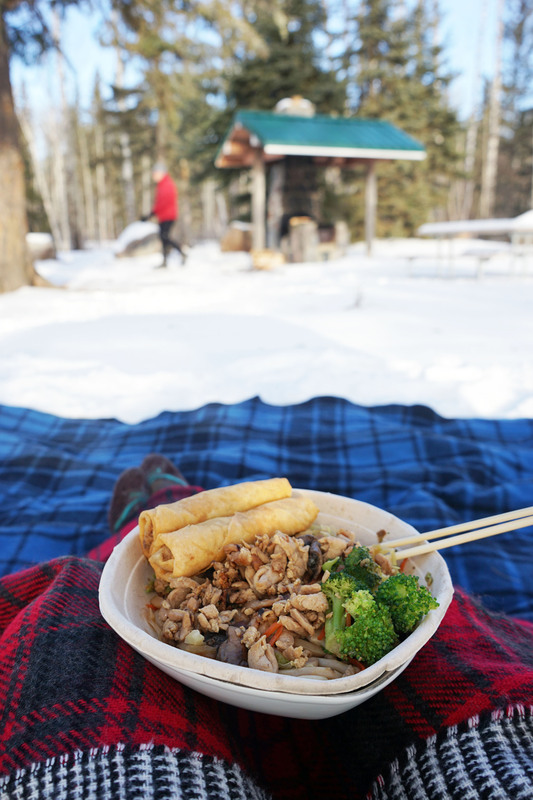 And, since there’s nothing wrong with getting creative with a good meal, I decided to pack a dish to-go while in Prince Albert National Park. 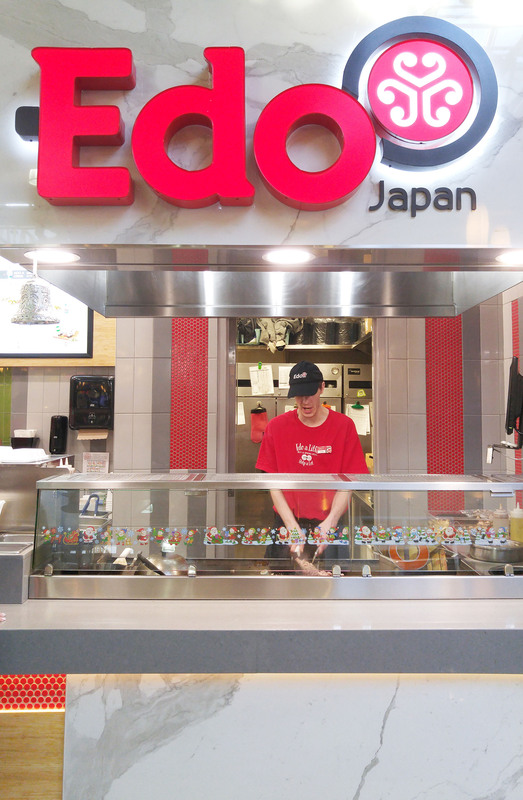 I stopped by Edo Japan on the way out of the city Saturday morning and grabbed a noodlefull chicken bowl to share. I also made sure to pick up a few spring rolls. But there’s another reason why I grabbed this particular meal. 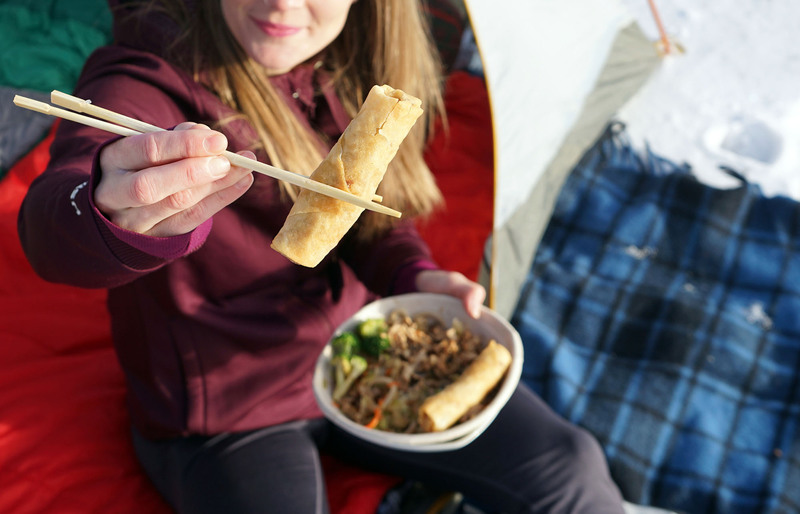 This holiday season, until January 2, Edo Japan is donating $0.25 cents from every spring roll purchased to local food banks. Yep – including right here in Saskatoon! 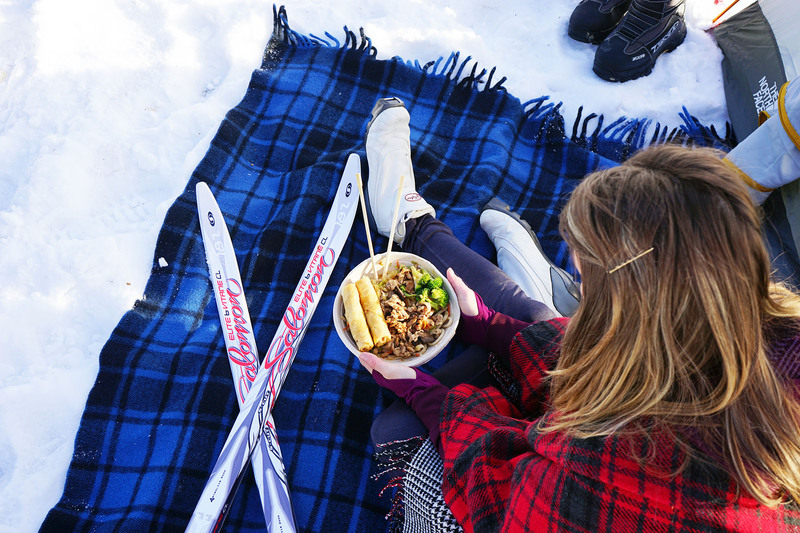 We were in a bit of a rush to get out on the trails, so we snuck a few bites while setting up the campsite and tucked the rest away for later. (I promise I did help set the camp up and didn’t just sit around eating all the food). 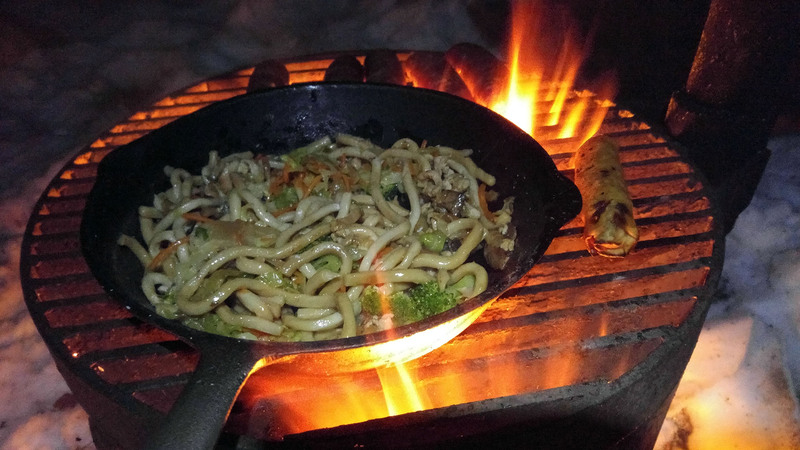 Back at camp that evening, we warmed up the rest of the noodle bowl in a cast iron pan. We cooked it over an open fire while watching the full moon rise over our campsite at Waskesiu Lake. 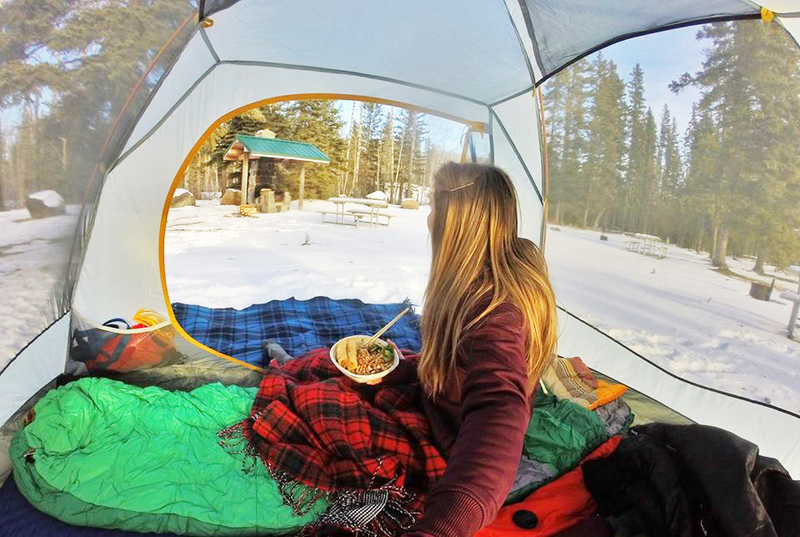 It was a quick and delicious camping meal to-go instead of eating a dehydrated meal pack. I was pretty pleased with the creative spin on a take-away order. 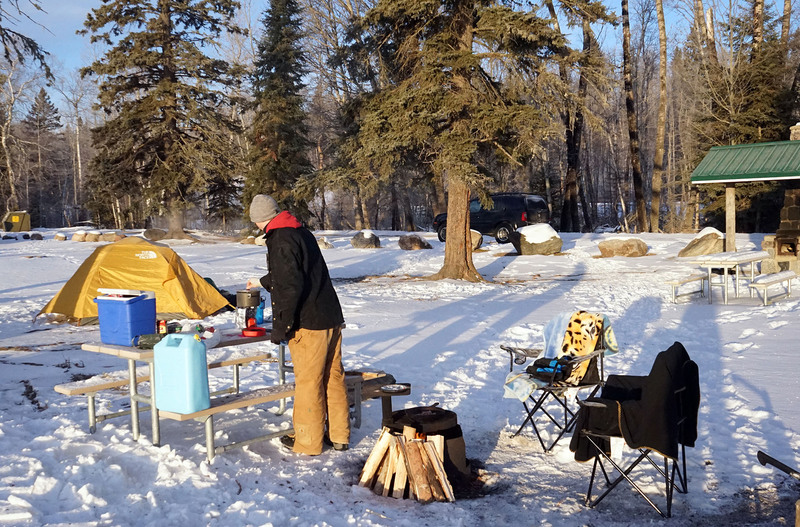 Winter camping in the snow, not having to cook a meal, and giving back to the community? I think that’s a perfect “unforgettabowl” holiday weekend away to Edo a little and help a lot. Hey Ashlyn – looks amazing. Love the food idea. So, here is a question I’m sure you get asked a lot. How do you keep warm? 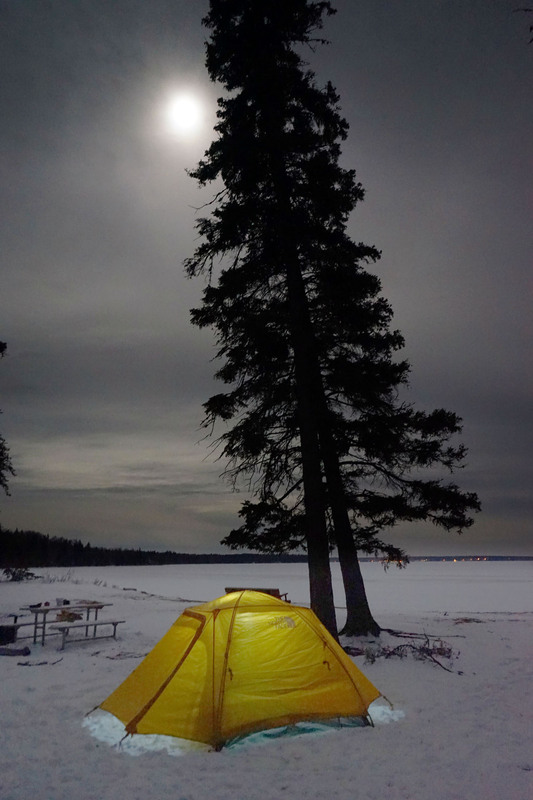 I have never winter camped simply because it gets pretty cold here in the Midwest US. December isn’t bad, but you just never know. Blankets, heater, etc? Obviously you use a fire but only outside the tent. Just curious. Looks really fun though. Great question! A few different ways. 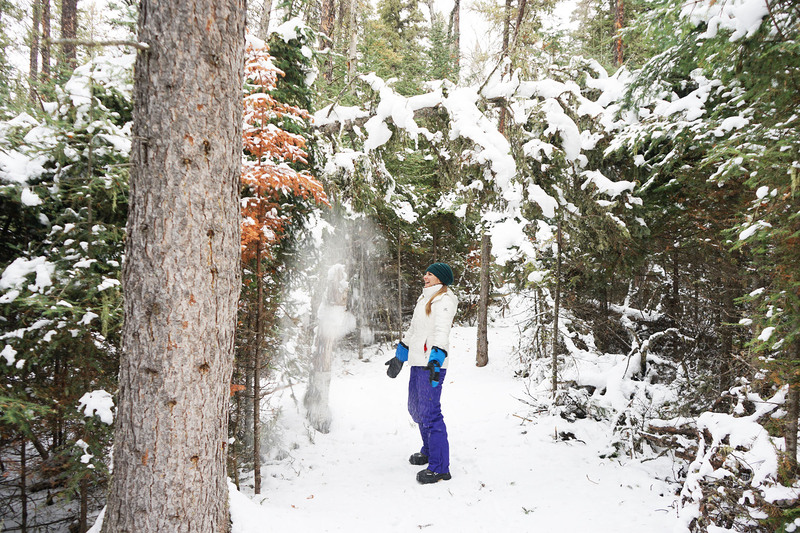 I wear lots of layers – good boots, ski pants, merino wool base and a winter jacket. Several layers of gloves depending if I’m active or sitting around the fire. I also have a few blankets I drag around with me (you can see one on the camping chair in the post above). At night, it’s all about having a good base beneath you. I use a thermarest as well as a reflective blanket beneath that and sometimes an extra zealite to keep me off the cold ground. Then a good sleeping bag topped with extra blankets depending on temperature. The trick is to balance gear with weather. It also depends if you’re front-country camping out of a vehicle or need to carry it all into the backcountry. Hope that helps!